Google Instant, the feature that pre-empts your search terms and shows the results of your predicted search as you type1, has started including branded business suggestions in the Autocomplete drop down menu. These stand out above all of the other suggested search terms and could be a huge pull for traffic to your website if you’re lucky enough to make it onto that fabled drop down. Google claims that by showing you search results as you type, you’ll wind up making better searches because you can adjust your terms accordingly during your search3. How many people actually do this is debatable and there are retorts of this actually slowing searchers down4. The Autocomplete feature that it uses to predict your search also has a built in spell checker so sloppy or quick searches aren’t penalized. Google says that it doesn’t necessarily prioritize the most popular searches with Google Instant5, as it tries to keep things personalized. 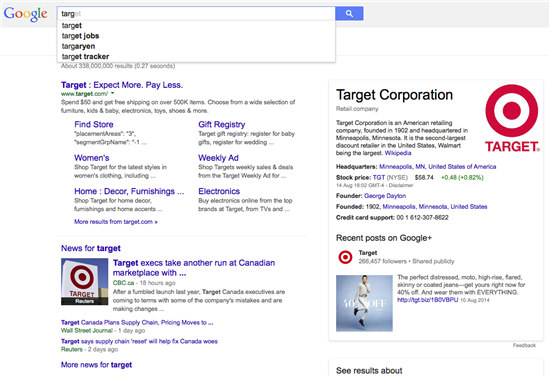 A personalized search is more valuable than a popular one, according to Google5. So depending on what country, state or town you live in1; whether you’re logged into a Google account or if your previous searches are stored in a cookie6, you’ll be seeing personalized searches unique to your location and browsing history. This means that what I see when I search won’t be the same as what you see when you do. Google Instant and Autocomplete work hand in hand and are valuable for businesses on a national and local level. If you’re included in the suggested searches, users can find you quicker. Plus, if you’re SEO strategy is strong, then you’re targeted keywords may feature in there, too. This all helps tempt traffic and potential customers to your website. However, typically, Google won’t do you any favors and include your business in Google Instant unless it’s sure that you’re the best match for the user’s search. And, even then, you’ll be one of four other suggestions in Autocomplete and many more on the search engine results page. Each one looking identical in terms of the way they're presented with only the physical hierarchy of the list to infer priority or relevance. However, things might be about to change. Is Google now prioritizing relevant businesses who are registered with My Business7 or Google Plus in favor of those that aren’t? There’s no question that our suggested search term certainly looks more attractive and tempting than the others on the list. It makes us stand out. It looks clean and professional and almost like a Google endorsement, as opposed to a simple suggested term. Although the other results aren’t related or our direct competition, will this feature stay when those suggested terms are filled with our competition? Where Will They Go With This? The potential for business growth as a result of this is huge. What if, instead of our address and zip code, Autocomplete showed quick synopsis of what we do and a phone number? Or a link to a contact form or our Twitter handle or even our most popular services or customer ratings and testimonials? What if the white space beside our address had a banner, a gif or even a video of a product tutorial? What if these enhanced branded suggestions were presented in a similar fashion to search results pages, so that when users search for “web design Seattle”, the Autocomplete and Google Instant suggest Fast Track in this fashion? The possibilities and opportunities that Google could unfurl here are endless. They could even replace the entire search engine results page with an even smarter Autocomplete and Instant fusion where all search results are shown in this fashion in the drop down. And, they could charge businesses for more interactive features, too. Whether all that is planned or not, I’m sure we’ll eventually find out. But, if you’re not currently registered to Google My Business7, you should do it now, get in early.